Okay, so at some point my obsession with all things no-bake-cheesecake has got to stop. To date I have made four different versions and there’s about five more on the way. Sheesh, talk about overkill! But I can’t help it; I have discovered just how easy these lovely desserts are to make and with regard to flavour, well, the sky is the limit really. It’s like 31 Baskin Robbin’s at my house lately ~ R is getting a touch concerned. However, I must state for the record that his “concern” is kinda selective, and limited to all the various cordials, syrups and flavoured liquors I have been buying up (space is getting tight in my liquor cabinet), but he has absolutely nothing to say about the end product coz he gets to eat them all at the end of the day. Todays cheesecake flavour is rather tropical; not the kind one would readily associate with the current season. Even R has been (cautiously) questioning my choice of flavours. He thinks I should be doing stuff that better reflects the cold, wet and dismal autumn weather outside; ‘fall recipes’ as he calls them. It sounds logical enough but right now I don’t feel like derailling my cheesecake bullet train, chugging full speed ahead with all these recipes swirling about in my head. Perhaps I will figure out a cheesecake flavour that is more tailored to the month of October soon; spiced pumpkin pie? Apple and Cinnamon? Blackberry? 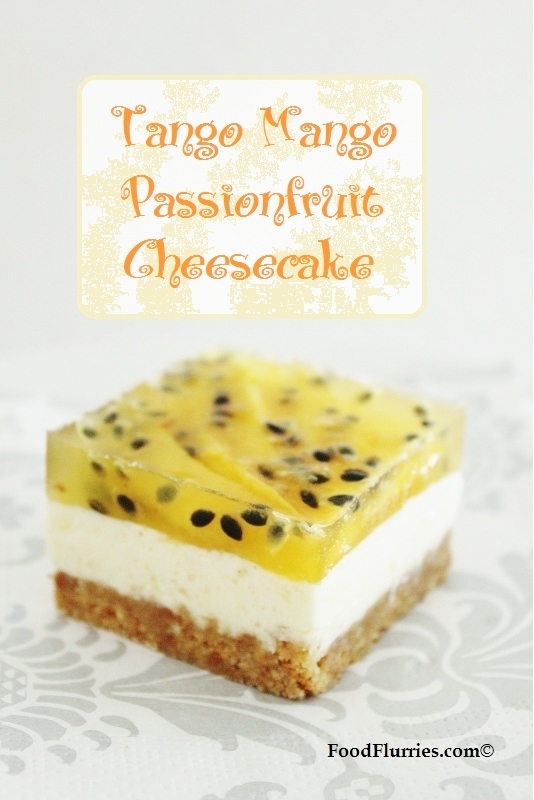 In the meantime, however, I am sticking with what’s in my head ~ Mango & Passionfruit! It’s all very beach resort-y; a classic island getaway fruit punchie beverage (sans colourful cocktail umbrella). Oh man, now I want to go on a holiday! This never fails to happen. For an 8-inch round springform tin I used about 400 grams of cream cheese and 1 cup of mango puree. 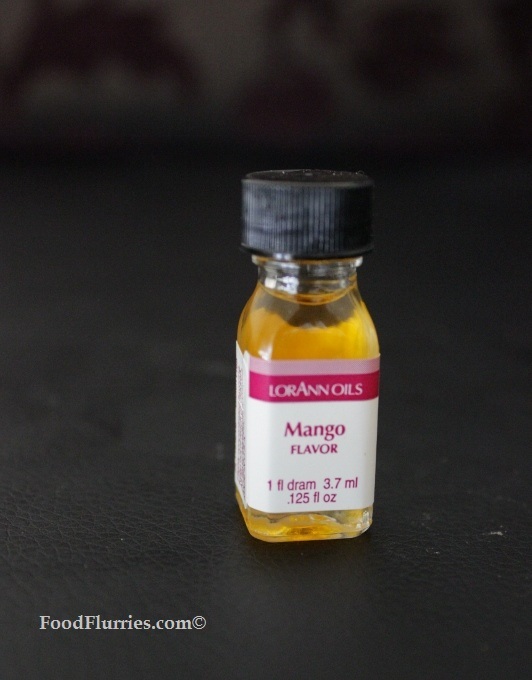 If you find that your mangoes lack enough flavour then you can always add in another half-cup of puree or do what I did and add a few drops of concentrated mango flavouring oil. A few drops go a long way so taste your cream cheese filling before adding more. We start by prepping our tin and the biscuit base of the cheesecake. I like to spray my tin with a bit of unflavoured cooking spray just to make it easy to unmould the cheesecake later. The bottom of the tin is also sprayed lightly and covered with a parchment paper disc. The biscuits are plain digestives, crushed and swetened with a bit of sugar, and held together with melted butter. This is then placed in the tin and pressed to the bottom and sides of the tin. I hate pressing the biscuits up the side coz they never seem to stay there, so I skip this bit entirely. Now place the tin in the freezer to set while you get your cream cheese filling ready. We start by placing the cream cheese in a mixing bowl along with the heavy whipping cream (which should contain 35% – 45% fat), sugar and condensed milk. Beat with electric beaters until thick and fluffy. Now add the mango puree and stir through. Taste the cream cheese filling and if it lacks a full bodied mango flavour then add in an extra half cup of puree or drop in some flavouring oil. You should be able to get this at cake supply stores or simply get it online. I got mine at a local candy store, Jamin. To set everything together the pre-bloomed sheets of gelatin are dissolved in some freshly boiled water and stired until smooth. Alternately you can dissolve the gelatin in some hot milk. I use gelatin sheets but you may choose to use gelatin powder. For the amount of cheese filling I would say two tbsps of gelatin powder dissolved in hot water should be ample. Pour the melted gelatin mixture into the cream cheese and stir very well to distribute evenly. Now remove the biscuit base from the freezer and pour the cream cheese filling on top, leaving a good 2 cm from the rim to accomodate the passionfruit jelly. Shake the tin gently to settle the mix. Tap the tin lightly on the work surface to get rid of any air pockets within the cheese mixture. Now return the tin to the freezer to set while you prep the passionfruit jelly layer. Anyway, I placed the passionfruit pulp with about a two tablespoons of the syrup and 100 mls of hot water in a bowl. Then I dissolved a sheet of pre-bloomed gelatin in the mix. 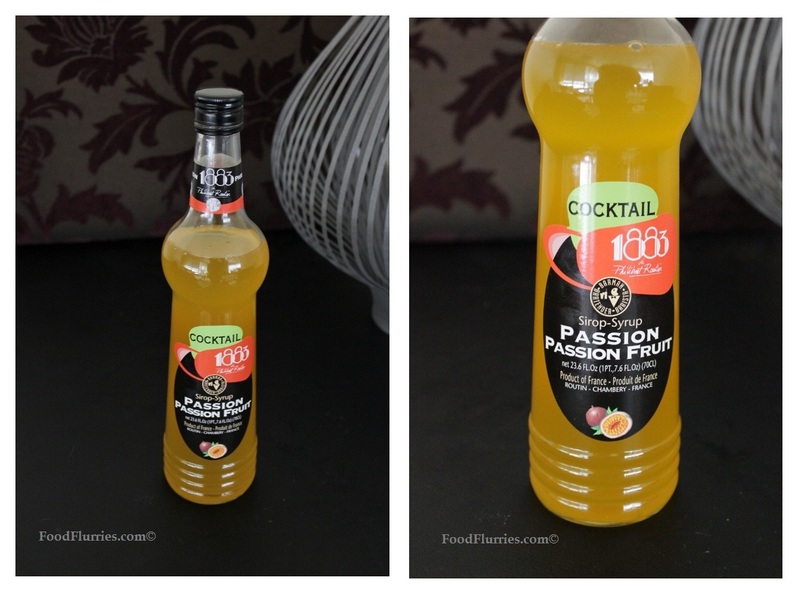 You want to make this mix just before pouring onto your cheesecake because it will set up rather quickly. I removed the already set cheesecake from the freezer and placed some sliced up mangoes on the surface. Then I made the jelly and immediately poured it over the sliced mangoes. Place the tin back in the fridge to set. I usually leave it in there overnight just to be sure everything is set up nicely before I start the unmoulding process. Looking at all the passionfruit seeds suspended within the jelly is pretty beautiful to look at. The next day you can unmould your cheesecake onto a serving platter and decorate it as you see fit. In the pictures I made individual serves using steel moulds so I didn’t have to worry about cutting them to the exact same size for their photo shoot. I must say these came out really well. They exuded tropical-ness and they had a really nice texture … very creamy with a wonderful contrast from the biscuits and the jelly layer on tip, not to mention the crunch from the passionfruit seeds. 1. Place digestive biscuits in a food processor with sugar. Pulse until you get fine crumbs. 2. Remove the biscuit crumbs to a bowl and mix with melted butter. 3. Place this crumb + butter mix in a lightly greased and lined 8″ springform pan with removable bottom. Press firmly to compress everything. 4. Place in the freezer to chill while you make the mango filling. 1. Place the soft cream cheese, sugar, condensed milk and heavy whipping cream in a mixing bowl. Beat until the mixture thickens slightly. 2. Add in the mango puree and mix in thoroughly. Taste your cream cheese filling to see if you are satisfied with it. If not then add in the flavoured oils. 3. Heat the milk in the microwave then melt the pre-bloomed gelatin sheets in it. Stir well to dissolve all the gelatin and then pour this into the cream cheese mixture. Beat everything well to ensure even distribution. 4. Remove the biscuit base from the freezer. Pour this mixture on top of the biscuit base then return the tin to the freezer to set. 1. 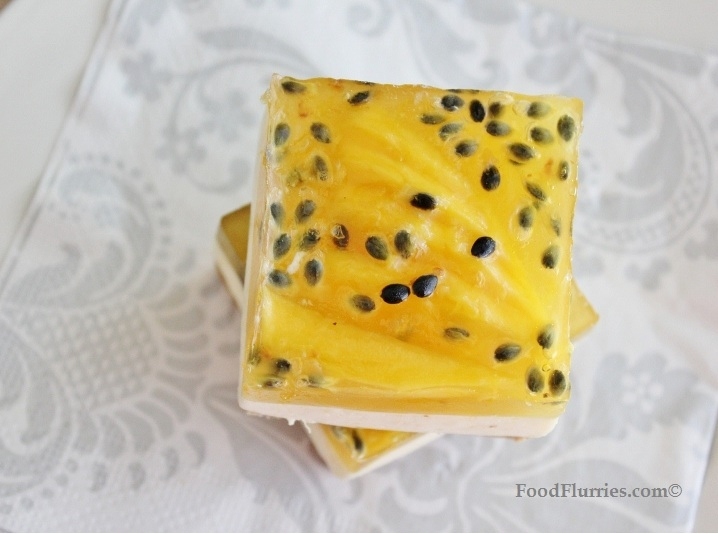 Mix the passionfruit pulp, hot water, syrup and pre-bloomed gelatin sheet in a bowl. 2. 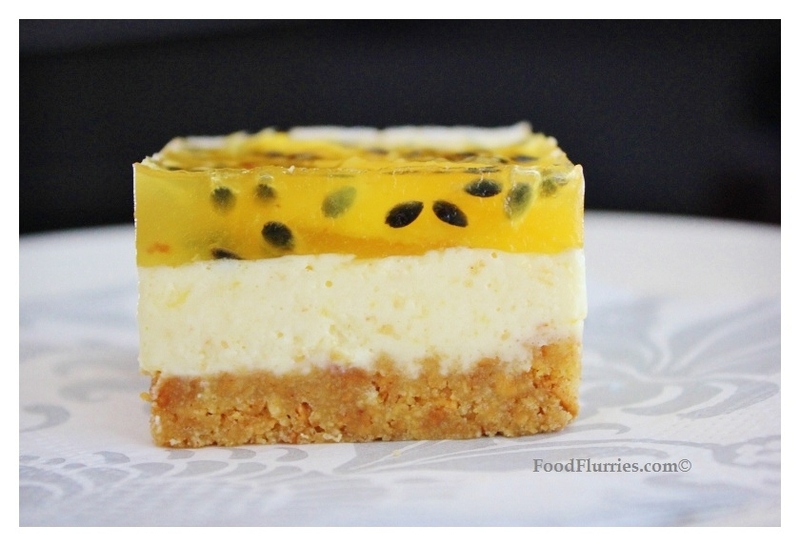 Remove the now-set cheesecake from the freezer and immediately pour the passionfruit jelly over the cheesecake. Swirl it around to cover the cheesecake evenly. 3. Place everything back in the fridge to chill for at least 4 hours, but for best results I like to leave it in there over night. 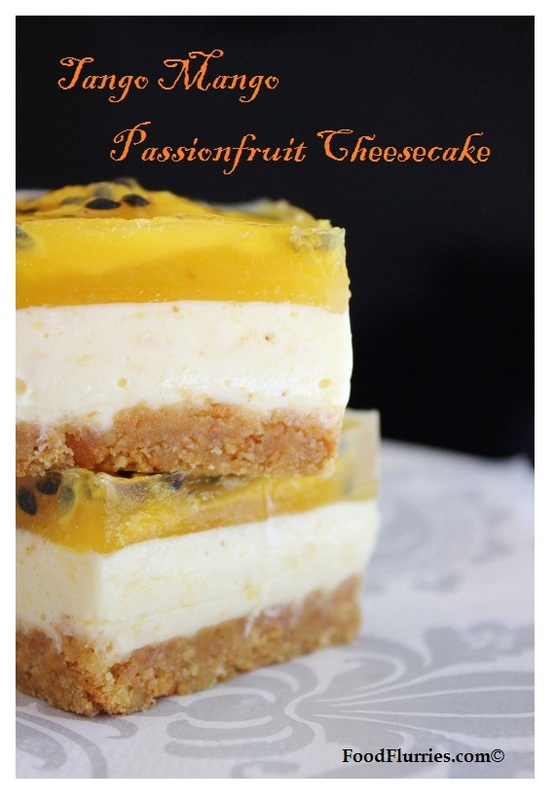 So there you have it, my version of a mango and passionfruit cheesecake. This, I realise, is a bit more involved than making a regular cheesecake but I assure you that the results are well worth the effort. R ate all of his share and then returned to ask for seconds … which of course there was none. A very summery flavour indeed, to be enjoyed with a nice wine spritzer perhaps? Whichever way you choose to enjoy this cheesecake I hope you can let me know by leaving me a note in the comments box below. If you like cheesecake, here is a list of the other flavours I have done in the past few weeks … all of them require no baking.